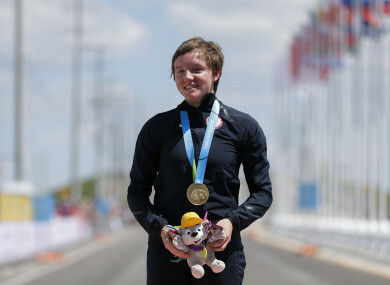 United States gold medalist Kelly Catlin poses after winning the women's individual time trial cycling competition at the Pan Am Games in Milton, Ontario in 2015. THE FAMILY OF American cyclist Kelly Catlin said today that the three-time world champion had been suffering from depression in the months leading up to her death last week. Catlin, who took her own life last Thursday, had struggled with depression in the wake of two crashes last year and had also attempted suicide in January. The 23-year-old had been part of the US team pursuit squads that captured world titles in 2016, 2017 and 2018 and also won a silver medal at the 2016 Rio Olympics. However her father told the Washington Post on Monday she had struggled to recover after an accident last October which left her with a broken arm, which was followed by a crash in December in which she sustained a concussion. Everything was open to her, but somehow her thinking was changed and she couldn’t see beyond, I guess, her depression,” he added. “After her concussion, she started embracing nihilism. Life was meaningless. There was no purpose. This was a person with depression. She was suicidal, her thinking was really dark, and she had taken to nihilism,” Christine Catlin said. Catlin was studying computational and mathematical engineering at Stanford University while also attempting to pursue cycling. She was also an accomplished violinist and artist. In a recent journal for the velonews.com website, Kelly Catlin had hinted in her struggle to juggle the different strands of her life. “Being a graduate student, track cyclist, and professional road cyclist can instead feel like I need to time-travel to get everything done,” Catlin wrote. “And things still slip through the cracks. Email “Olympic silver medallist Catlin battled depression before suicide, say family”. Feedback on “Olympic silver medallist Catlin battled depression before suicide, say family”.